In our previous blog we described the differences between events and messages and now it’s time to take our new-found EM knowledge and relate it back to the advantages that SAP EM can provide. The benefits of SAP EM are dependent on the specific challenges an organization faces. This blog describes common challenges that we face today and the 2nd part of the blog will show how SAP EM can be leveraged to address this issues. Inflexible Business Model: In today’s environment, where supply chains are evolving into networks of entities, each performing their specialized tasks, having an inflexible business model leads to inefficiencies. Referring to Figure 1, a typical supply chain requires many entities to perform all the tasks required to move product from supplier to customer. New suppliers and logistics companies are always entering the marketplace as well as new entities, such as innovators and outsourcing partners. The challenge for today’s company is to quickly on-board these entities, giving them visibility to your supply chain network and integrating them into their supply chain processes. Global pressure to reduce costs and increase service levels force companies to strive toward the most effective and efficient Supply Chains. Customers have a “I want it now” mentality and in order to remain competitive in this environment, companies need to whittle out every inefficiency in their supply chain. This is called “Collapsing the Supply Chain”. How can we quickly adapt to our changing supply chain needs? 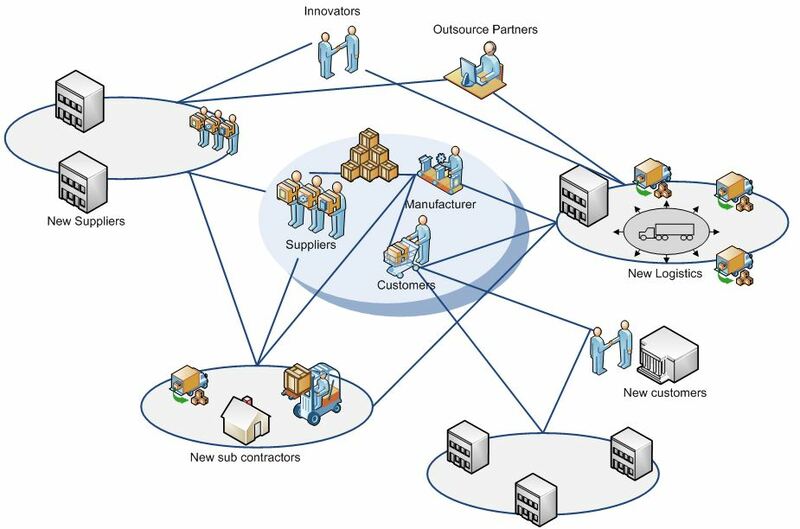 Demand Driven Network out of sync from Supply: Supply Chain Networks are demand driven. As demand for goods and services increases, the supply chain must readjust by increasing supply at all points in the network. How can we keep up with demand without overextending ourselves on supply? Globalization complexity causes uncertainty ad chaos: In today’s economy where the customer base is worldwide, and supplier’s locations are less relevant, it is imperative to know how well the global supply chain network is performing. In today’s world a business must contend with different systems, different languages, different time zones, different political structures, different regulations, different currencies etc…. Many incongruities exist that must be kept in delicate balance at all times. How do we keep it all on track? Slow to innovate: Passion exists to reinvent and innovate. Curiosity seeks the answer to what it will take to drive the next revenue stream or capture the next cost reduction. As these new innovative thoughts become reality, they need to be introduced quickly into the supply chain for benefits to start being realized. If the innovation is a new product, then time-to-market is critical. To achieve a short turnaround time, the supply chain network must respond quickly. How do we on-board a new idea quickly and get everyone in the chain working towards a common goal? Limited Visibility to Process Status: When the supply chain network spans several organizations, there is limited visibility into each process’ status. In other words, it is difficult to see what is happening inside a supply chain process as it progresses from one entity to another. This lack of visibility leads to implementing manual process tracking and reporting capabilities as a solution, which can become very expensive. In addition, companies may decide to buffer their inventory to ensure delivery is achieved on time. Overstocked warehouses are inefficient and lead to a costlier inventory holding than is needed. How is my process performing? Long Cycle Times: There is an increasing need to collapse the supply chain – in other words, to reduce the period of time required to complete an operation. In order to achieve this reduction, minutes, even seconds, need to be shaved off of the time to action. Companies define ‘The Plan’ for a process. Any deviation from ‘The Plan’ is immediately reacted upon because an alert is sent to the appropriate individual, as opposed to having the bottleneck go unnoticed until it is too late. Poor Customer Service: What happens when a customer calls inquiring about the status of their order? Without a complete picture of the supply chain process status, only a limited, outdated response can be offered, resulting in poor customer service. Good customer service leads to loyal customers. Keeping customers is a critical part of the business as it is more expensive to acquire a new customer than it is to retain an old one. Losing repeat customers will rapidly impact a company’s bottom line negatively. Where is my product? Why is it delayed? When can I expect it to be delivered? If an exception happens in my supply chain, can I automatically adjust the resource planning for future activities? Risk mitigation: When products are shipped internationally in large containers, a high probability of contraband being included in the shipments exists. With thousands of containers being offloaded at ports around the world every day, government security agents are overwhelmed with the responsibility of monitoring who has had access to these Returnable Transport Items. Meeting government reporting requirements and insuring the safety of citizens in the destination countries are two of the tasks best accomplished by SAP EM. This system makes it easy for companies to show compliance at each leg of the supply chain network. SAP EM also makes it easy to record the exact location of the Returnable Transport Item, how long it was there and who was the responsible party. Complex reporting needs: Reporting regulations are rigid and demanding in today’s world. How can it be guaranteed that regulatory needs are being met by the reports? In addition, with a fast moving, demand driven, global process that is constantly changing, how can it be guaranteed all partners are performing? How is it possible to ensure that all bottlenecks are being addressed and load balancing is occurring? How often are target expectations missed? Do exceptions occur frequently? Summary: A common thread runs through all the challenges listed above. The first common element is the ability to respond – Companies cannot easily respond to these challenges when they have inflexible business models that hinder innovation. The bar for implementing efficient processes is high and hard to reach. For companies to stay competitive, i.e., to be able to react on a 24/7 basis, not 8/5, becomes increasing difficult as more economies around the world join the global marketplace. The second common element is efficiency – With the need to move new innovations to market quickly, efficiency is key. Additionally, achieving efficiency without sacrificing quality is essential. Business ability to respond quickly / adapt…. A third element is stability – If all the Supply Chain partners execute according to the plan, there are few unknowns in the process. If exceptions occur and we know that there is a process in place to effectively and efficiently deal with them, then we can still consider the process to be relatively stable. With a stable process in place we have the piece of mind to implement less “buffer” in to our process, thus collapsing the Supply Chain and leading to improved service levels. In the next part of this blog we will explore how SAP EM addresses these issues….